Written by Roger Malcolm Even a man who is pure in heart and says his prayers by night may become a wolf when the wolfbane blooms and the autumn moon is bright. 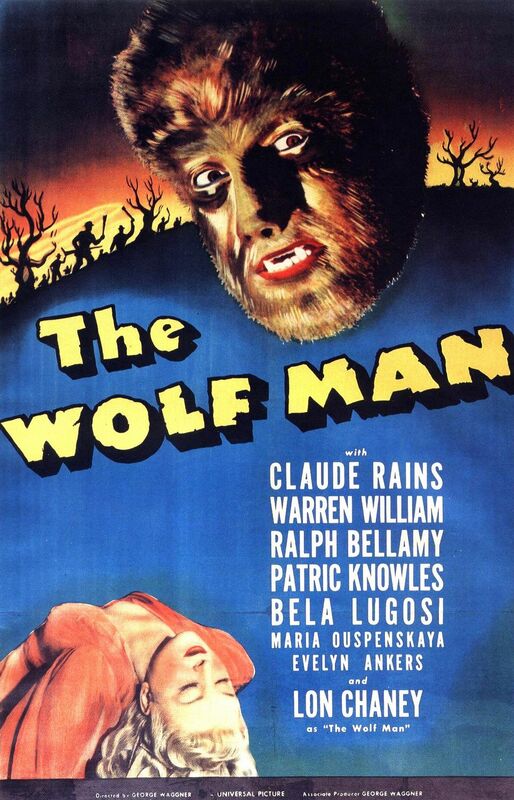 Universal’s The Wolf Man, directed by George Waggner, starring Claude Rains as Sir John Talbot and Lon Chaney Jr. as Lawrence Stewart Talbot, was written for the screen by Curt Siodmak. It’s commonly mistaken as the first of it’s kind but Universal had released what is the first feature film depicting an anthropomorphic werewolf in Werewolf of London (1935) as well as a lost silent short film The Werewolf (1913). Originally both Werewolf of London and The Wolf Man would have utilized the same make-up effects of legendary make-up artist Jack Pierce, though his designs were rejected on Werewolf of London for a more simplified and less time-consuming approach. Pierce more famously created the make-up for Boris Karloff’s roles in both Frankenstein (1931) and The Mummy (1932). He would also do make-up for Bela Lugosi’s character in White Zombie (1932) and many other horror films of the time. After the opening credits a book is pulled from a collection on a shelf, opened and it reads: LYCANTHROPY (Werewolfism). A disease of the mind in which human beings imagine they are wolf-men. According to an old LEGEND which persists in certain localities, the victims actually assume the physical characteristics of the animal. There is a small village near TALBOT CASTLE which still claims to have had gruesome experiences with this supernatural creature. The sign of the Werewolf is a five-pointed star, a pentagram. enclosing a… the scene transitions to our lead Lawrence Talbot riding passenger in a open top vehicle. The driver points stating “Talbot Castle Mr Larry.” giving a hearty smile which is returned by Lawrence. When they arrive Lawrence is greeted by his father John Talbot, both are happy he’s home. The Chief Constable of the District Paul Montford, whom Lawrence grew up snatching apples with, is just leaving after stopping in to say hello welcoming Lawrence back. Alone with his father, Lawrence discusses his sorrow over the death of his brother. 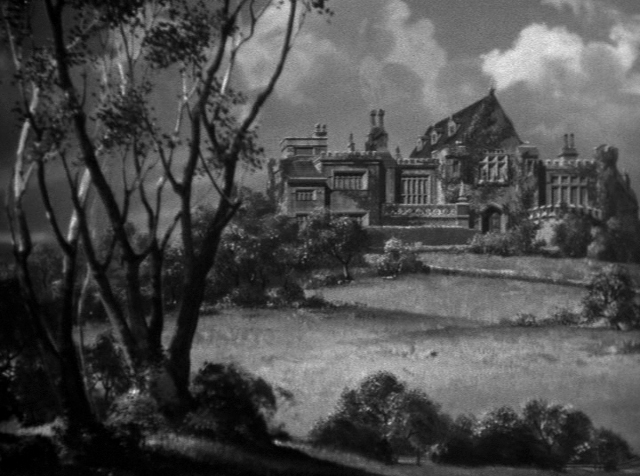 Sir John Talbot admits it was a blow to everyone, yet it’s a sad commentary on their relationship that it took a hunting accident and the death of his brother to bring Lawrence home again. Lawrence reassures his father that it’s not all as bad as it sounds as he watched every bit of news of his father and was mighty proud when he won the Belden Prize for Research. Now after being gone for 18 years Lawrence and his father shake hands agreeing there will no longer be any such reserve between the two. They are interrupted when a box from London labeled GLASS is carried into the room. It’s a new part for the telescope which is in the attic which has now been turned into an observatory. Lawrence finishes installing the new part and has his father test it out by looking into the town below. Impressed his father inquires as to where he learned such precision work and then departs. Lawrence stands from his crouch then sits taking a look into the telescope watching the mundane activities of the townspeople when he notices a woman in a room. He adjusts the lenses focusing in sharp detail on her as she stands by an open window trying on earrings. He lowers the telescope revealing Charles Conliffe Antiques Bought and Sold below. The next scene we see Lawrence walking up outside of the Antique shop and entering. 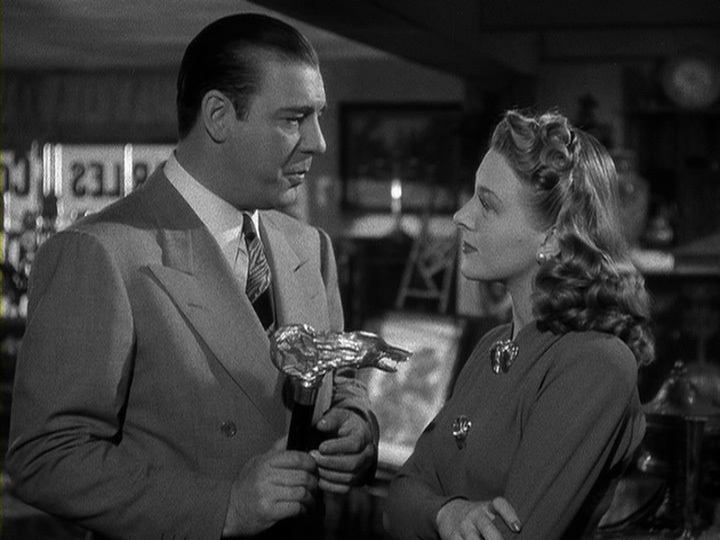 He is greeted by the same woman, named Gwen played by Evelyn Ankers, he saw in the telescope. He says he’s looking for a gift, something in the earring type. Though it’s clear he’s not here to shop as he doesn’t take his eyes off Gwen refusing all the options saying he’s “looking for something half-moon shaped with spangles on it, golden”. Gwen says they have nothing of the type when Lawrence reveals that she does on her dresser up in her room causing her to be taken by surprise. She’s more interested in how he knows than alarmed though. However, she does suggest her father may be able to help him. This causes Lawrence to say “No, no that won’t be necessary.” directing his attention to buying a cane instead. Gwen inquires as to how he knew she had the earrings. Lawrence explains he’s psychic and that every time he see a beautiful girl he immediately knows everything about her. She avoids his directness by inquiring what type of cane would he like. She suggests a classy golden top cane, then one with a little dog on it saying “That would suit you”. “No thanks” says Lawrence grabbing one for himself which he jokes would make a good putter. He mistakes it for another dog but Gwen corrects him saying it’s a wolf actually. He takes a closer look asking the meaning behind the wolf and star. Gwen jokes saying “I thought you said you were psychic”. Lawrence reassures her he is but “this is only wood and silver and hasn’t blue eyes”. Gwen says “That stick is priced at 3 pounds” which leads to an outburst from Lawrence that it’s “15 dollars for an old stick”. Gwen explains it’s a very rare piece depicting the wolf and pentagram which is a sign of a werewolf. Lawrence is clueless to what a werewolf is and asks Gwen, who tells him it’s a human being that changes into a wolf during certain times of the year. Gwen recites an old poem “Even a man who is pure in heart and says his prayers by night may become a wolf when the wolfbane blooms and the autumn moon is bright”. Lawrence asks about the pentagram which Gwen says every werewolf is marked with it and sees it in the palm of their next victim’s hand. Lawrence tells Gwen she’s not getting very far if she’s trying to scare him out of the store but that he’ll purchase the cane after all. Lawrence arranges a date at 8 with a resistant Gwen to have their fortunes told as they watch gypsy fortune tellers arrive in town. Back home in Talbot Castle, Lawrence questions his father about werewolves. His father states that even though it’s legend it must have some basis in fact stating “it’s probably an ancient explanation for the duel personality in each of us”. He goes on to recite the same old poem Gwen did. Lawrence arrives back at the antique shop where Gwen awaits outside. Still she is hesitant to go but calls out for a friend of hers named Jenny played by Fay Helm. Jenny wants her fortune read as well, so both the ladies take an arm and off they go into the outskirts of the city when they come upon wolfbane growing at the base of a tree. This discovery leads Jenny to recite the same old poem. Lawrence says so you know that one too which Gwen says of course everyone knows about werewolves as Jenny picks several branches of wolfbane. 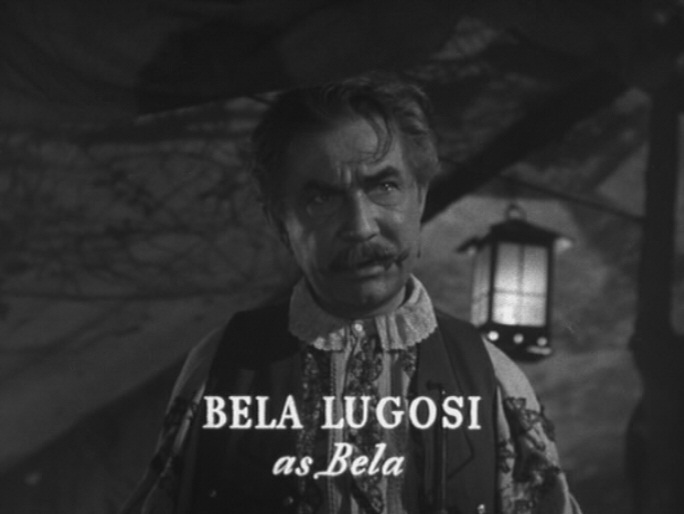 They arrive at the gypsies camp, Jenny is quick to go first inside with gypsy, played by the always wonderful Bela Lugosi. Jenny lays the wolfbane on an upside down bowl on the table as she splits a deck of cards at the request of the gypsy. Outside Lawrence convinces Gwen to take a walk with him as Jenny has her fortune read. Lawrence reveals to Gwen how he discovered her and her earrings. Gwen reveals to Lawrence that she’s engaged to be married very soon. Back with Jenny the gypsy notices the wolfbane, grabbing it and tossing it to the floor. He grabs his head revealing a 5 point star on the right side of his forehead. Jenny slightly impatient asks what he saw, though he asks for her hands stating “Your left hand shows your past, your right hand shows your future”. When he looks at her right hand a pentagram appears inside a circle. Frightening her the gypsy warns her to leave, to go quickly. As Jenny runs, the gypsy is seen by his mother outside with his hands covering his face, then the gypsy’s horse becomes spooked and we hear a wolf’s howl cut through the dead night. Lawrence and Gwen take notice as well, then they hear Jenny scream causing Lawrence to run off after her leaving Gwen. Lawrence with his wolf-head cane comes upon a wolf attacking the body of Jenny. Lawrence rushes forward clubbing the wolf repeatedly as the struggle heightens eventually leading to the creatures death and a vicious bite on Lawrence’s chest. Gwen finds Lawrence stumbling through the woods and assists him in returning home with help from the gypsy woman. The locals with the Chief Constable discover Jenny’s body with a vicious animal bite in her jugular, the body of the gypsy with a crushed skull and the wolf-head cane laying near. In the morning Lawrence awakes to knocking as his father, the constable and Dr. Lloyd enter his room to question him about the events of the night. Lawrence swears he killed a wolf, only no wolf was found. He shows his chest as proof as he was bitten by it, only the Dr. examines his chest and not one bite or scratch is to be seen. At the suggestion of the Doctor, Lawrence is left to get rest. Only without any definite answers, everyone including Lawrence is left mystified by the events. Lawrence attempts to find answers leading him to make the statement “Why does everyone insist that I’m confused”. The answers will come but not in the way Lawrence expects as the townspeople become hysterical as the news spreads throughout the town building the suspense as the mood heightens. Hunting parties are dispatched as the search of a wolf is on the mind of all. Lon Chaney Jr.’s depiction of the werewolf in The Wolf Man made it a staple horror character due in large part to Pierce’s achievements in make-up. Immediately, Fox studios released their own werewolf feature titled The Undying Monster (1942), later Columbia would follow suit with The Werewolf (1956) and American International Pictures would release I Was a Teenage Werewolf (1957) and How to Make a Monster (1958). 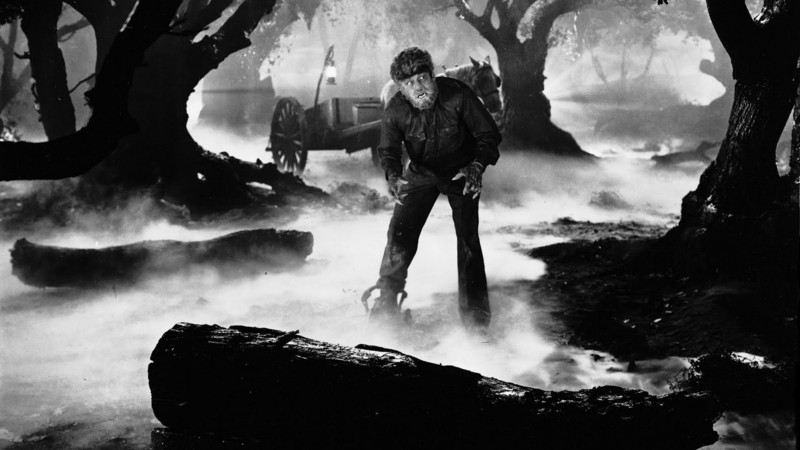 Universal Picture’s would release 4 more films depicting Lon Chaney Jr. as The Wolf Man in Frankenstein Meets The Wolf Man (1943), House of Frankenstein (1944), House of Dracula (1945), and Abbott and Costello Meet Frankenstein (1948). Universal Picture’s would also remake The Wolf Man in 2010 starring Benicio Del Toro as Lawrence Talbot with makeup effects by Rick Baker. As iconic a horror character can get, Universal’s The Wolf Man is most deservedly a horror classic. I give it 3 out of 5 for a rating of Really Good.